The Holidays just aren’t complete without those adorable animated figures Santa, Rudolph & Frosty! I have certain shows and movies that I must watch or it just isn’t Christmas. That’s why I have the video’s on the one’s I believe will be off TV soon. Thankfully I received the Original Christmas Specials Collection: Deluxe Edition for free in exchange for this post. Now I know my granddaughter (or any other grandkids) will never miss Rudolph, Santa or Frosty. 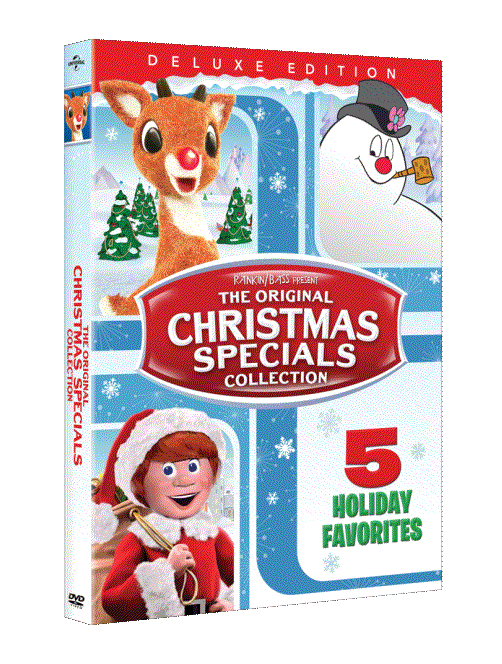 ‘Tis the season to enjoy the timeless holiday classics in The Original Christmas Specials Collection: Deluxe Edition featuring 5 unforgettable stories. Produced by the legendary Rankin/Bass, Rudolph the Red-Nosed Reindeer, Santa Claus is Comin’ to Town and The Little Drummer Boy feature iconic Animagic™ stop-motion animation. While Frosty the Snowman and Cricket on the Hearth are beautifully illustrated. Featuring all-new bonus features and unforgettable characters, experience these five classic holiday specials with your whole family. Fred Astaire, Jimmy Durante, Mickey Rooney, Danny Thomas, Burl Ives and many more. These favorites also feature some of the most beloved songs of the season and are sure to entertain audiences of all ages for generations to come! Reimagining Rudolph in 4D: A behind-the-scenes look at the making of the newRudolph the Red-Nosed Reindeer attraction film.